Taking aluminum out of the diet is not difficult, but it can get somewhat complicated and quite frustrating. One’s attempt to follow the guidelines of Aluminum-Abstinence Therapy (AAT) could end in failure if one doesn’t have sufficient knowledge about the subject.Foods and products that contain aluminum are listed [in bold] in the next section, but before the lists are examined, please read the information below. It must be thoroughly understood before one begins AAT. Many patients appear to worsen from time to time, confusing those involved in their care; and sometimes those who use AAT for AD prevention find that it doesn’t help. There are many reasons for this, including the following:Abstaining from aluminum may not appear to be effective if one is taking drugs, breathing vapors or consuming toxic substances of any kind. The reason for this is because chronic drug use and/or toxic substance exposure may cause side-effects similar to the symptoms of aluminum toxicity.Millions of microscopic particles of various toxins are ingested daily by those who are exposed to outdoor smog, work in toxic environments and/or consume contaminated water. Although AAT will work to reduce the level of toxicity in the brain, it cannot perform miracles. Significant results may not be seen when overdoses of these and other toxins, including alcohol, over-the-counter medications and/or prescription drugs are ingested continuously. In other words, when the brain becomes overwhelmed, its performance is minimized until one’s intake of toxic substances is dramatically reduced.The following story will help illustrate this point. One Alzheimer’s patient became oppositional and uncooperative, even though he had been on AAT for over two years. His family believed that the therapy was not working and that the disease was progressing. One day, this man refused to eat or drink anything, including his prescription drugs. When the problem worsened, his family decided to follow his advanced directives allowing him to die. But he didn’t die. Three days later, he surprised us when he got out of bed, dressed himself, and was cordial and cooperative to the point of helping others! What made the difference? His behavior improved because his brain was given the chance to excrete the offending drugs. In other words, because the drugs were stopped (inadvertently), the man’s brain was finally able to cleanse itself. After the man’s family had his medications appropriately adjusted, their father was cordial and co-operative from that point on. This incident made it clear that continuous ingestion of drugs and other toxic substances can obscure or complicate the performance of Aluminum-Abstinence Therapy. Other health conditions can hinder the brain’s ability to cleanse itself, as well. Many of these will be addressed on the Foundation website. THE FOLLOWING LISTS INCLUDE FOODS AND HOUSEHOLD PRODUCTS THAT MILLIONS OF PEOPLE CONSUME EVERY DAY, SOMETIMES MANY TIMES A DAY. IF ANY OF THESE CONTAIN ALUMINUM, IT MEANS THEY CONTAIN POISON. THE MORE ITEMS CONSUMED, THE MORE POISON IS INGESTED. Don’t panic. Numerous aluminum-free baked goods are available in ordinary grocery stores, as well as health food stores and restaurants. Simply read labels to be safe. When prescription drugs are necessary, one’s first line of defense in preventing food and drug poisoning is to curtail the number of toxins consumed on a daily basis. They add up quickly. One breakfast waffle normally contains one “dose” of aluminum. (A dose is considered the amount required to cause an obvious effect, such as a change in behavior.) One muffin eaten for lunch adds another dose; and a dinner biscuit adds another. The day’s total of aluminum equals 3 doses. Remember, the more items eaten, the more aluminum is ingested. When prescription drugs are consumed as well, the amount of toxicity in the brain can rise to injurous levels, especially when over-the-counter drugs are taken at the same time. Caffeine overdose can create even more problems. When the brain becomes dehydrated, behavior changes are commonplace. Indeed, when chocolate, caffeinated drinks, herbal diuretic teas, packaged diuretic herbs, body-building and diet supplements are eaten as well, negative behavioral episodes can easily occur. Even vitamins can become toxic when taken in excess. When signs of toxicity appear, they should be taken very seriously. Call your doctor to discuss symptoms, disclosing all substances that could be at fault. Follow the doctor’s orders and begin abstinence immediately. 1. Assume responsibility for safeguarding your own health. Do not expect that the Food and Drug Administration is protecting you. They are not. All the facts are not in. Scientific investigation is still in its infancy. 2. Learn how to read medication descriptions. Ask your doctor or pharmacist to explain what is difficult to understand. 3. Write to manufacturers. Ask for ingredient disclosures to be mailed to you. Most are willing to respond. 4. Learn to say no, even in social situations. If you suspect that party foods contain aluminum (refer to list above), choose items that are most likely aluminum-free. This habit may be difficult to cultivate at first, but as you observe how contaminated foods affect your mind, moods and emotions, abstinence will become easier and less troublesome as time goes on. 5. Ask restaurant managers to examine food and salt labels before ordering questionable items. 6. 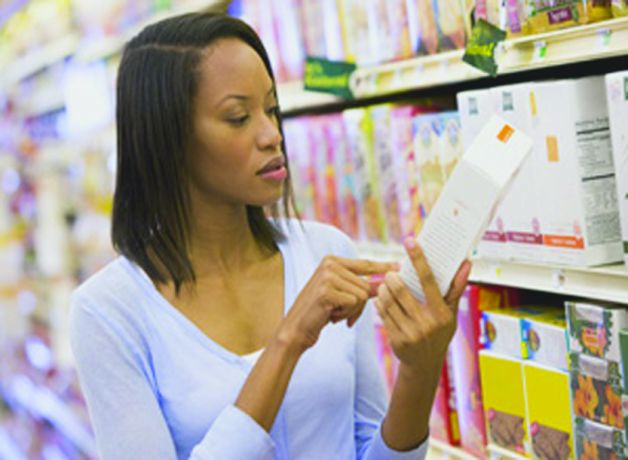 Examine all package labels before making a purchase. 1. Consumer rights: You have a right to know what you are ingesting. 2. Consumer protection: Prevention of allergic reactions. 3. Protection of manufacturers. Disclosures and warnings help prevent lawsuits. UNFORTUNATELY, THESE LAWS ARE FLAWED. laws for the chemical ingredients of salt. are no warning labels to alert the consumer. 3. Product labels are not monitored adequately. confusing to the uneducated consumer. list another form of aluminum on the package, deceiving consumers. 8. Some vendors of crystal deodorants (made with mineral salts and other ingredients) claim that “alum” is not aluminum. This is not true. The dictionary defines alum as “Aluminum sulphate”. 9. Manufacturers frequently change ingredients, but the law does not require package warnings. Thus, be sure to read every label. If time constraints prohibit this, check labels as often as you can in order to protect yourself. 10. Laws that do exist are not adequately enforced. This is true in many restaurants as well. The following is a list of familiar fast-food establishments. Most do not post ingredients on menus or anywhere else, including the Internet. Literature is available to consumers, however. MC DONALD’S Hamburgers: The salt sprinkled on their foods contain aluminum. Individually-wrapped packages of salt contain aluminum. To request that all their products become aluminum-free, write to: McDonald’s Corporation, One Kroc Drive, Oak Brook, IL 60523 or call (630) 623-3000. Eye opener article. Please keep me updated.